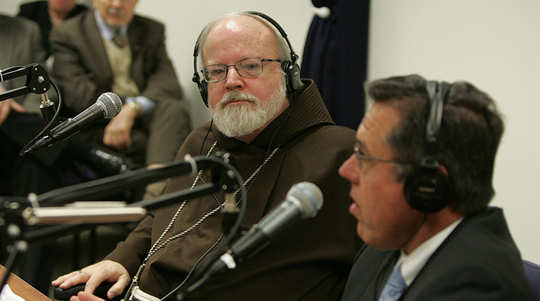 Today’s guest(s): Cardinal Seán O’Malley, Archbishop of Boston; Tom Peterson, founder and president of Catholics Come Home; Janet Benestad, Secretary of Faith Formation & Evangelization for the Archdiocese of Boston; and Jim Wright, founder & president of The Station of the Cross. A summary of today’s show:The Archdiocese of Boston marks Ash Wednesday with the launch of the Catholics Come Home initiative. Cardinal Seán and Tom Peterson talk to Scot and Fr. Matt about their hopes for the initiative and discuss the TV commercials that will be airing on every major channel in the Boston area throughout Lent. 1st segment: Two of the commercials, “Epic” and “Movie”, were aired and each participant gave his impression of the ads and their favorite images and messages. Tom Peterson shared that in other diocese where the initiative has launched and the commercials have aired have seen hundreds and thousands of people return to church and even for those who were in the pews every Sunday, many returned to the regular practice of the Sacrament of Confession. Even some of the actors who worked on the commercials had experiences that brought them back to the Church. Cardinal Seán said he launched The Light Is On For you campaign as a complement to Catholics Come Home. He said Lent is a baptismal retreat for Catholics, a time to renew our baptism. “Jesus invited us to clean the inside of the cup, too,” he said. It is a time to learn how to be loving and forgiving to others, as the Lord is to us. Where better to learn forgiveness than in that sacrament. The cardinal gave his advice on Lenten resolutions. The Gospel speaks of prayer, almsgiving, and fasting. Some people today speak of giving up smoking or going on a diet, which isn’t bad, but Lent should have a spiritual meaning. We should set aside time for prayer and reflect on the Word of God. The discipline of Lent and giving things up, like sweets or television, is useful in itself. It’s an opportunity for us in our society, who often live a very soft life, to identify with the sufferings of others. Segment 2: Janet Benestad talked about the scenes in the “Epic” commercial that were localized for Boston. She knew that it would have an affect on people in Boston who see it. Our late colleague David Thorp, who was director of the CCH effort in Boston and who died tragically in January, was himself in one of the scenes, playing a homeless man helped by a priest. Other scenes include students near Harvard walking along the Charles; a sister and children in front of Fenway Park; Mission Church in Boston; and fishermen by Fish Pier in South Boston receiving a blessing from a priest. Cardinal Seán has asked all Catholics to share their faith and offer an invitation. Tom Peterson gave tips for how people should feel comfortable in sharing their own stories, where they have found hope and answers in their faith. “I know how you feel. I felt the same way too, but I found in my life that the faith has…” Nobody cares how much you know, until they know how much you care. We will win hearts and minds with love, not debates. He asked all to pray everyday for the Holy Spirit to give us opportunities wherever we may be to share the Gospel, to recognize the moment, and to have the courage. Every Wednesday we will announced the winners of the week’s WQOM Benefactor Raffle. The winners this week are Paul & Elaine Mongeon of Woonsocket, RI. They will receive a copy of the “Diary of St. Marie Faustina Kowalska” (Divine Mercy In My Soul). To enroll in the raffle, go to WQOMand click on the link to “Benefactor Card”. Segment 3: Jim Wright, founder & president of The Station of the Cross network, which includes WQOM. The new radio station, which began on November 1, 2010, has been very successful in Boston, including a very successful fund drive in December. The Station of the Cross is sponsoring a conference with Fr. John Corapi in Boston next August at the TD Garden. If it sells, it could be the biggest gathering of Catholics in several decades. Jim is confident that the event could sell out. He encourages both individual and group sales. The Station of the Cross is looking for a benefactor who can donate about 1,000 square feet of office space for WQOM, ideally within 25 miles of Framingham where the transmitter is located. Contact WQOM via their website. Unfortunately I missed the live show on Wednesday. Will you be making past episodes available for download? Thanks for your interest. We’ll be making the show available online every day, usually during the evening after the program airs. Soon, you’ll also be able to subscribe to the program in iTunes. We’ve updated this posting to include the live link to play yesterday’s program.